This article is about the city. For the modern country, see Sri Lanka. For other uses, see Lanka (disambiguation). Lanka /ˈləŋkɑː/ is the name given in Hindu mythology to the island fortress capital of the legendary demon king Ravana in the epics of the Ramayana and the Mahabharata. The fortress was situated on a plateau between three mountain peaks known as the Trikuta Mountains. 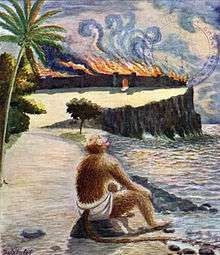 The ancient city of Lankapura is thought to have been burnt down by Hanuman. After its king, Ravana, was killed by Rama with the help of his brother Vibhishana, the latter was crowned king of Lankapura. The mythological site of Lankā is identified with Sri Lanka. His descendants were said to still rule the kingdom during the period of the Pandavas. 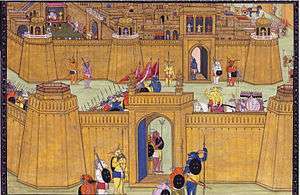 According to the Mahabharata, the Pandava Sahadeva visited this kingdom during his southern military campaign for the rajasuya of Yudhishthira. According to both the Ramayana and the Mahabharata, Lanka was originally ruled by a rakshasa named Sumali. According to Uttara Kanda, Lanka was originally built by the divine architect Vishwakarma for the gods, but was seized by the brothers, Malyavan, Sumali and Mali. The brothers ruled for years and invaded the heavens. After suffering a humiliating and disastrous defeat at the hands of Lord Vishnu, the brothers were too ashamed to return to Lanka. Kubera seized control of Lanka and established the Yaksha Kingdom and his capital was guarded by rakshasas. His half-brother Ravana, son of the sage Vishravaya and Sumali's daughter, fought with Kubera and took Lanka from him. Ravana ruled Lanka as king of the Rakshasa Kingdom. The battle in Lanka is depicted in a famous relief in the 12th-century Khmer temple of Angkor Wat. After Ravana's death, he was succeeded by his brother, Vibhishana. There has been a lot of speculation by several scholars, that Ravana's Lanka might have been in the Indian Ocean around where the Maldives once stood as a high mountain, before getting submerged in the Indian Ocean. 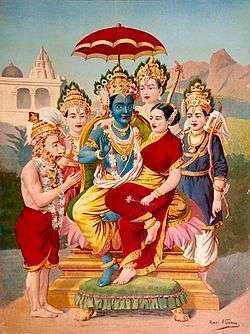 Many of the references to Lanka in the Mahabharata are found in sage Markandeya's narration of the story of Rama and Sita to king Yudhishthira, which narration amounts to a truncated version of the Ramayana. The references in the following summary are to the Mahabharata, and adhere to the following form: (book:section). Markandeya's narration of the story begins at Book III (Varna Parva), Section 271 of the Mahabharata. The son of Pandu, viz. Sahadeva, conquered the town of Sanjayanti and the country of the Pashandas and the Karanatakas by means of his messengers alone, and made all of them pay tributes to him. The hero brought under his subjection and exacted tributes from the Paundrayas (Pandyas?) and the Dravidas along with the Udrakeralas and the Andhras and the Talavanas, the Kalingas and the Ushtrakarnikas, and also the delightful city of Atavi and that of the Yavanas. And, He having arrived at the seashore, then dispatched with great assurance messengers unto the illustrious Vibhishana, the grandson of Pulastya and the ruler of Lanka (2:30). Lanka king is listed as present in the conclave of kings present in Pandava king Yudhishthira's Rajasuya sacrifice. .. The Vangas and Angas and Paundras and Odras and Cholas and Dravidas and Cheras and Pandyas and Mushika and Andhakas, and the chiefs of many islands and countries on the seaboard as also of frontier states, including the rulers of the Sinhalas, the barbarous mlecchas, the natives of Lanka, and all the kings of the West by hundreds, and all the chiefs of the seacoast, and the kings of the Pahlavas and the Daradas and the various tribes of the Kiratas and Yavanas and Sakras and the Harahunas and Chinas and Tukharas and the Sindhavas and the Jagudas and the Ramathas and the Mundas and the inhabitants of the kingdom of women and the Tanganas and the Kekayas and the Malavas and the inhabitants of Kasmira ... (3:51). Lanka, with its warriors, and horses, elephants and chariots (3:149). The walls of Lanka (3:282). ↑ The Indian calendar, with tables for ... – Google Books. Retrieved 26 January 2011. ↑ "Bharath Gyan". Bharath Gyan. Retrieved 26 January 2011. ↑ Vālmīki; Venkatesananda, Swami (1988-01-01). The Concise R_m_ya_a of V_lm_ki. SUNY Press. ISBN 9780887068621. ↑ The Hindu Pantheon - Edward Moor - Google Books. Books.google.com. Retrieved 2012-11-07. ↑ Excerpta Máldiviana - H.C.P. Bell, Harry Charles Purvis Bell - Google Books. Books.google.com. Retrieved 2012-11-07. ↑ Ravana - The Great King of Lanka - M.S. Purnalingam Pillai - Google Books. Books.google.com. Retrieved 2012-11-07. ↑ "Valmiki Ramayana - Sundara Kanda - Sarga 9". Sanskritdocuments.org. 2008-12-07. Retrieved 2012-11-07. ↑ The Society of the Rāmāyaṇa - Ananda W. P. Guruge - Google Books. Books.google.com. Retrieved 2012-11-07. ↑ Srimad Valmiki-Ramayana - Vālmīki - Google Books. Books.google.com. Retrieved 2012-11-07.